Etched Champagne Flutes for the Bride & Groom, or simply dinner for two. Glass front has Initial and last name. Back of glass has wedding or anniversary date. Add names to the base of the glass for additional personalization. 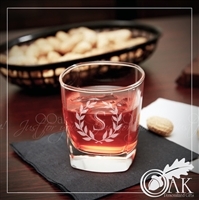 $8 shipping at check-out Set of four etched glass coasters. Have your initial etched inside of this decorative wreath for any gift giving occasion. Coasters are approx. 4 3/4" square. $10.00 shipping at check-out This unique family tree, showcased the name of those that you love most in life. Etched glass block, approx 4" x 6". Stand alone. Add the names of up to 20 family members. Names will be arranged, per OOak's discretion.